The "Vermählungsbrunnen" or Wedding Fountain on the Hoher Markt Square in Vienna is the centre of a friendly plaza and surprisingly quiet given that it is at the heart of the city centre. The erection of the fountain is linked with a promise that Emperor Leopold I made in 1702: His son Joseph (the later Emperor Joseph I) had left to participate in a siege of the Fortress of Landau; the Emperor swore that he would donate money for a fountain with a religious display. The son came back and the Emperor - didn′t do a thing. Only when Leopold I died in 1705, his two sons donated a considerable sum of money and a memorial was finally built. The first "Vermählungsbrunnen" was actually only a pillar, designed by Johann Bernhard Fischer von Erlach. It was opened in 1706 and dedicated to the parents of Christ, the Virgin Mary and his step-father Saint Joseph. This pillar was flanked by two allegories of piety and purity and at its base, it was equipped by statues of Mary, Joseph and a high priest alongside with a symbol for the Holy Trinity. The wooden construction didn′t last for too long; by 1732, it was in very bad shape and much of the wood had rotten. This was when a new memorial was to be built, now made of stone and metal - and fine stone it was. Now the Vermählungsbrunnen was to become an actual fountain and the basins were made from marble from the town of Adnet in Salzburg (a traditional source of marble for Austria until today - the indoor pillars for the Houses of Parliament are the biggest single chunks of this marble in Vienna). There is a total of four basins, embracing the statues of Mary, Joseph and the High Priest. It is a wedding scene of Mary and Joseph, a very unusual motive in art. Four angles on each corner of the Vermählungsbrunnen hold the columns that built up to a baldachin made of brass. 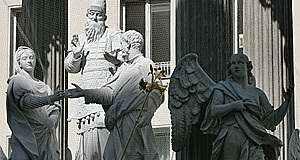 The statues were made by the Venetian artist Antonio Corradini. With the opening in 1732, the two creeks of Hernals and Alserbach were combined - they now nourished most fountains in central Vienna, which on the other hand resulted in a lack of water in the creeks themselves. During WWII, the Vermählungsbrunnen was severely damaged by bombs. Between 1950 and 1955, it was restored, but the head of Mary had to be replaced by a copy. A recent refurbishment until 2008 makes the Vermählungsbrunnen look nice and shiny again. Attractions nearby are numerous - the Stadttempel (main synagogue), Stephansdom, the Peterskiche and the old City Hall of Vienna as well as the Judenplatz Square. Several other attractions of the first district are within easy walking distance.